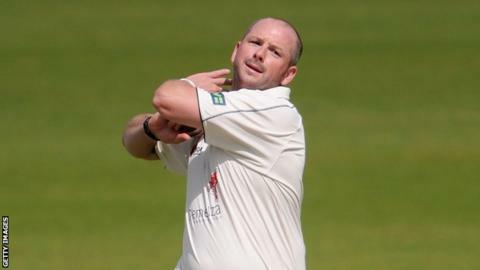 Darren Stevens dragged Kent back in the game by cutting short Leicestershire's first innings with a five-wicket haul on day two in Canterbury. The Foxes resumed on 300-5, but Stevens (5-88) ran through the middle-order and tail as they were all out for 386, despite 57 from debutant Lewis Hill. Kent made a slow start in reply, losing Daniel Bell-Drummond and Rob Key early to Australian paceman Clint McKay. Brendan Nash followed, but Joe Denly's 56 not out saw them to 155-3 at stumps. Earlier, Hill watched as Ben Raine (12) was trapped lbw and McKay was caught by Bell-Drummond, but he moved onto a maiden half-century from 79 balls. He shared an eighth-wicket stand of 66 with Rob Taylor, who was left high and dry on 33 not out after Stevens took the new ball. Leicestershire's final three wickets the went down for eight runs in the space of four overs. Hill later made his first contribution with the wicketkeeping gloves when he caught Nash off Taylor. But bad light ensured an early finish to proceedings with Sam Northeast (38) joining Denly in an unbroken stand of 79. "It was tough going because Leicestershire bowled pretty well in pretty gloomy conditions for the last hour or so. We had to graft hard for those runs. "If we're honest, we didn't create enough pressure with the ball on the opening day but Darren Stevens' spell this morning has got us back into things." "I was honoured to get selected and so proud to get my cap yesterday, so to get a 50 as well was brilliant. "It would have been nice to go on and get three figures and, looking back at the replays, I have to be disappointed with the shot. "But, if you'd offered me 57 yesterday, I'd have gladly taken it."